You can catch up with all of the National League news from February here. Meanwhile, check out the gossip page for the latest rumours and see our list of the latest manager ins and outs. FC Halifax Town have extended the loans of Salford City striker Devante Rodney and Cheltenham Town forward Manny Duku until the end of the season. Former Chesterfield player, manager and assistant manager Kevin Randall has died aged 73, the National League club has announced. Randall scored 96 goals for the Spireites and was assistant to John Duncan when Chesterfield reached the FA Cup semi-finals in 1997. Braintree Town have signed Slovenian left-back Sven Karic, 21, on loan from Championship club Derby County for the rest of the season. Aldershot Town have agreed, subject to contract, a 119-year lease with Rushmoor Borough Council for their EBB Stadium home. Chairman Shahid Azeem said the agreement would give the club "the opportunity to provide a redevelopment of our historic and much loved stadium to ensure a sustainable model for the future". Lewis Hardcastle has left Blackburn Rovers to join Barrow on a permanent deal. The 20-year-old had been on loan at the National League side since early February, scoring twice in nine appearances. Salford City have signed right-back Tyler Forbes on loan from Newport County for the rest of the season. The 23-year-old has made 20 appearances for his League Two parent club this term. Relegation-threatened Havant & Waterlooville have signed Montenegro Under 21 goalkeeper Matija Sarkic on loan from Championship side Aston Villa until the end of the season. The 21-year-old, who played in the first two rounds of last season's FA Cup while on loan at then-League One side Wigan Athletic, is eligible to feature in Tuesday night's clash with Maidenhead United. Meanwhile, Havant & Waterlooville have also signed midfielder Harry Donovan, 21, on loan from Championship side Millwall until the end of the season. Second-placed Solihull Moors have signed Burton Albion midfielder Joe Sbarra on loan until the end of the season. The 20-year-old has made 16 appearances for the League One Brewers in 2018-19. George Carline, 25, has extended his contract with National League side Solihull Moors until the end of the 2019-20 season. Maidenhead have signed full-back Ricky Gabriel following his release by Braintree Town. The 27-year-old made 30 appearances this season for the Iron. Colchester winger Ryan Gondoh has joined FC Halifax Town on loan. The 21-year-old has made six appearances for the League Two side this season. Hartlepool United have signed former Sunderland midfielder Adam Bale, 20, on a deal until the end of the 2019-20 season after he impressed during a trial. Bromley centre-back Jake Goodman will miss the rest of the season after rupturing an anterior cruciate ligament. The 25-year-old, who has played 22 games this season, suffered the injury in their 2-0 defeat by Boreham Wood. Leyton Orient midfielder Jordan Maguire-Drew, 21, will be out for about four weeks after suffering a calf injury against Aldershot. The 20-year-old has so far made seven appearances for the Bluebirds, and scored in their 3-1 win at Wrexham. 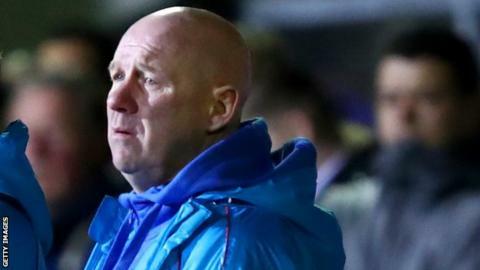 National League North promotion hopefuls Stockport County have agreed an "improved and extended" contract with manager Jim Gannon to run until 2021. The 50-year-old has guided County to second in the table, just one point behind leaders Chorley. Bromley have signed striker Reeco Hackett-Fairchild on loan from Charlton Athletic until 6 April. The 21-year-old has made 12 appearances for his League One parent club this season, and also had a loan spell at Boreham Wood. Havant & Waterlooville have signed free agent right-back David Banjo, 28, and he could make his debut against Dagenham & Redbridge on Tuesday. Boreham Wood have signed midfielder Charlie Cooper, 21, on loan from League Two club Forest Green for the remainder of the season. Bromley have extended the loan of Charlton Athletic midfielder Brendan Sarpong-Wiredu, 19, for the rest of the season. Ebbsfleet United have signed Gozie Ugwu, 25, on loan from Chesterfield for the rest of the season, Ugwu, who had a spell with Boreham Wood earlier this season, had a loan spell with the club in 2011-12. Maidstone United forward Jake Robinson has rejoined National League South club Billericay Town for an undisclosed fee. The 32-year-old scored one goal in 11 games for Maidstone after signing for them in December. Braintree Town have released midfielder Lyle Della-Verde, 24, who joined them last summer and scored three goals in 29 appearances for the club. The Iron have signed winger Aaron Eyoma, 21, from Championship side Derby County on a month's loan. Hartlepool United have signed Canada international centre-back David Edgar, 31, on a short-term contract. A winding-up petition brought against Gateshead by HM Revenue and Customs for just over £20,000 has been dismissed, the National League club has said. However, the club says it "still needs to make payment in full as soon as possible to prevent further action from being taken".